If you’re a growing subscription business, facing the pains that come with growth, your first priority may be to upgrade your ERP system. With your finance and operations teams drowning in transactions and manual work, you may think the solution is a better financial system. Sure your back office is struggling, but that’s a symptom of a bigger problem, not the root cause. And heading straight for an ERP upgrade is not the answer. In the product economy, every order was considered to be a new sale. 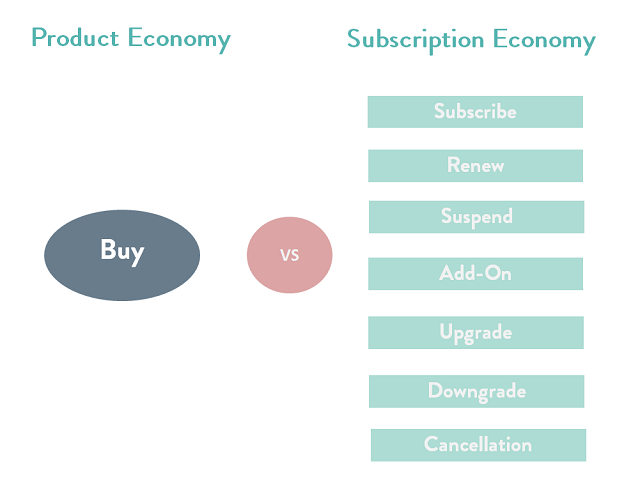 But in the subscription economy, it’s more complex because sales revolve around an ongoing customer relationship: a new order could be a sale or any change to an existing subscription, from upgrades to downgrades, renewals to cancellations. It’s a new model built around your subscribers. And ERPs simply aren’t built to manage it. For your subscription business, you need a system that can track all of these changes, and then feed that information back into all of your other systems. The fact is: you need to focus on subscription billing management first. The very nature of a subscription business is that you have to manage the ongoing customer relationship. To do so, you need a system that can handle all aspects of a subscription business, from a customer perspective as well as a finance perspective — things like new purchases and add-ons, but also invoicing and payments, pricing experimentation and subscriber analytics, and more. 1. No unified customer view. There’s no discussion amongst your multiple disparate systems. This makes it hard to calculate your operating metrics such as monthly recurring revenue (MRR), annual recurring revenue (ARR), and annual contract value (ACV). This also means it’s hard to really know your subscribers and build the meaningful relationships that result in reduced churn rate and increased upsells and cross-sells. ERPs were built to track products, not customer relationships. The subscription economy demands new ways to measure and monetize customer relationships. One system to own the entire subscription lifecycle so that, for example, you have a single view of a customer who signs up online, upgrades more seats, then calls into sales to do a larger team deal. Your front office systems don’t connect to the back office. For example, you have a hard time tying a customer in Salesforce to that same customer in your financial management system. There is no true customer master. How do you know that Company X which purchased your Pro version is the same Company X that is paying $2000 in monthly invoices? You don’t. An ERP can’t help eliminate your “swivel chair interface” — an apt description for the physical movement of shifting back and forth between systems. At best you might devise a complex manual workaround to temporarily patch together your systems — but it’s not a long-term solution. One single system that connects your systems from quote to cash. 3. Growing billing and collections. The amount of manual work your finance team does in spreadsheets is out of control. This manual overload is partially a result of there being a disconnect between systems, but it’s also a result of growth. As your number of customers increases this exponentially increases the number of transactions that you’re processing. Your finance team simply can’t keep up and headcount is a massive expense. ERPs claim to have a recurring component, but this isn’t core. As your billing and collections grow, you need a system that’s built to scale exponentially, easily able to manage the complexity of numerous plans, a range of terms, and a variety of payment methods across a growing user base. On average, over the lifetime of a subscription, there will be 26 revenue-related transactions. Every time a subscriber subscribes, adds more seats, downgrades, hits their ceiling and goes into overage charges, upgrades to a higher edition — these are revenue-related transactions that your system needs to manage. Now multiply this by a growing number of subscribers and you’re beginning to see the real problem, that a series of complex spreadsheets just won’t solve. Because ERPs work on the fundamental assumption that enterprises sell products, their core processes and workflows are built on this foundation. This means they aren’t built to manage the revenue associated with subscription service changes such as renewals, upgrades, and add-ons. The success of today’s subscription businesses depends on their ability to measure the connections between bookings, billings, cash flow, and revenue. If your system can’t connect the dots, your bottom line will suffer. 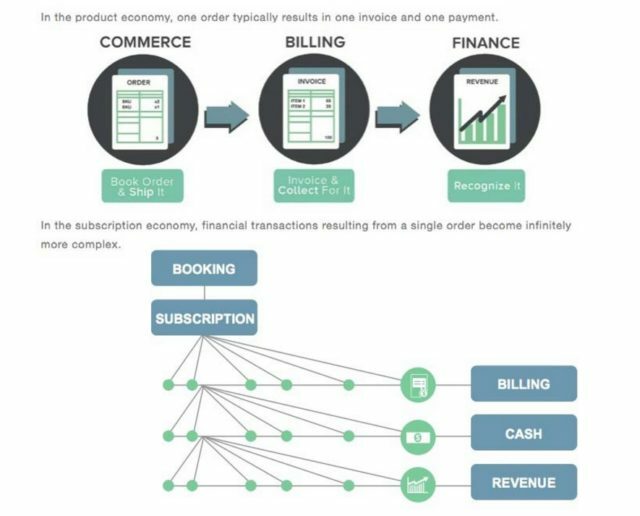 A subscription business relies on the interconnectivity of an army of systems. It’s not just critical to choose the right systems to support your growth trajectory, but to appropriately sequence implementation of your systems. Before solving your financial problem, subscription businesses need to focus on the customer problem. Just look at a company like Bettercloud, a B2B data security company and Zuora customer. They implemented Zuora before their ERP because they knew they had to solve for the issue of subscription management before taking on the finance/back office. Because they started with Zuora, even with 30 million end users, their finance team is now able to close the books every month in just five days with only 2.5 full-time employees. And, since their founding seven years ago, Bettercloud has continually grown 100% year over year. Can a new ERP help you do that?